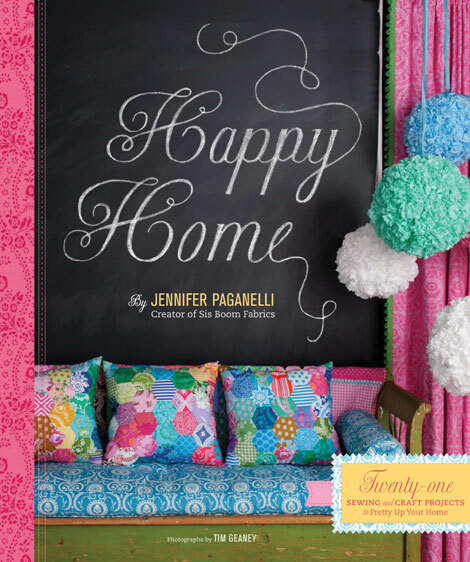 Win a Copy of Happy Home by Jennifer Paganelli! 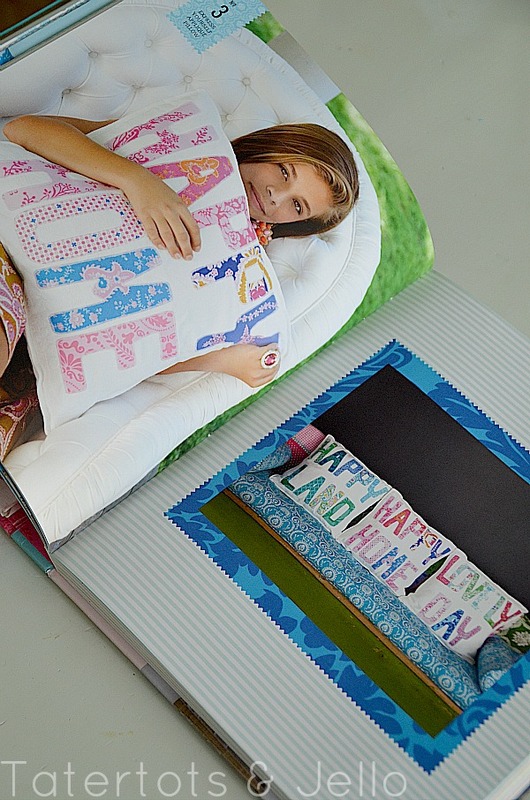 Birthday Giveaway — Happy Home Book from Jennifer Paganelli! It’s my birthday. And to celebrate — I am having a couple of FUN giveaways!! I remember when I first started blogging and I stumbled across Jennifer Paganelli’s site — Sis Boom. I was blown away by her use of color and whimsical style. I left a comment on her blog and was so thrilled when she answered me back. And since then my respect and admiration for Jennifer has just grown. She is such a nice person and SO talented. She designs the most beautiful fabric. 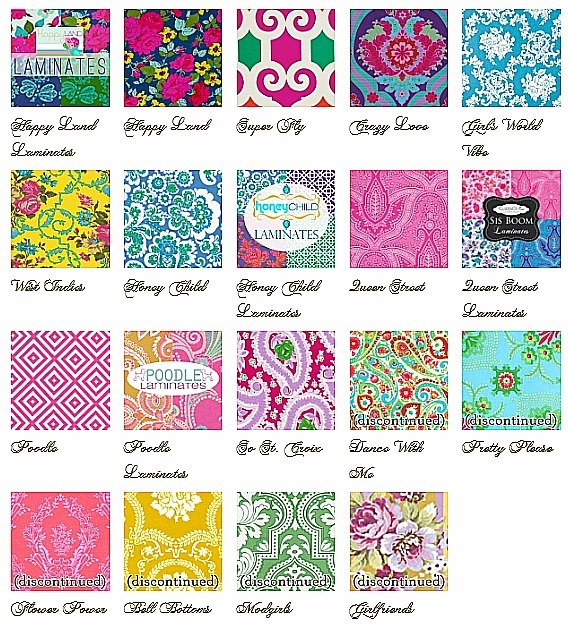 It has been so fun to see all of the amazing things that are happening for Jennifer and Sis Boom Fabrics. 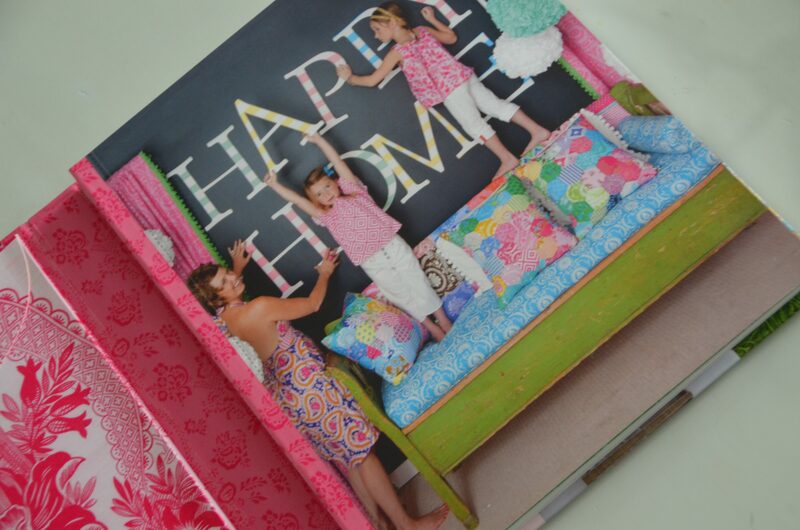 And her latest book – Happy Home is my favorite yet!! Jennifer shows how to whip up 21 beautiful accessories that will add some happiness to YOUR home. I love that Jennifer also includes step-by-step instructions and patterns which are included in the cutest front pocket of the book. The photos are beautiful too!! Happy Birthday! The book looks like it has some great colorful ideas.. Love it! Happy Birthday! Love your blog and thanks for the entry into this fantastic book! Love It! hope you had a great birthday! what a pretty book–love that garland shown. Hello Jen! New to your site. My birthday & my two daughters’ all fall in the same week in September as well as my wedding anniv. (we just celebrated our 15th!). I hope you had a joyful day on your birthday. 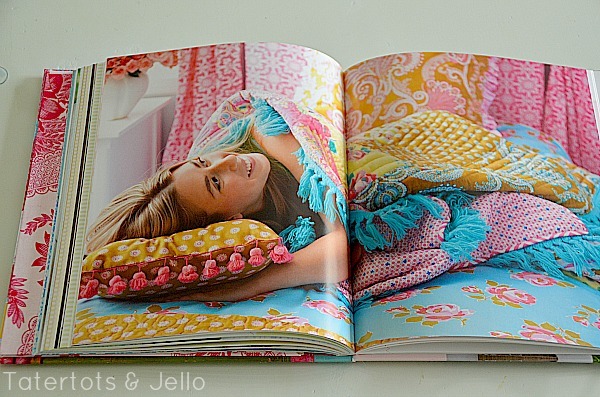 This book is so bright & cheery! I haven’t learned to sew yet but my 13 yr. old does. She will love it! What a great giveaway! The book looks amazing. I would love to read this book. Bright fabic always makes me happy. My kind of book. What a fun, happy book!!!! I asked my library to get this book in. I can’t wait to read it. thanks for the giveaway. Would love the book. The colors in this book make me soooooooo HAPPY! Happy Happy Birthday! And thanks for offering a giveaway! Looks like such a beautiful inspirational book! HAPPY BIRTHDAY!!! Jessica D.
I truly liked Jennifer’s website! Full of Optimism! Oh my!! What a fun book!! Love it! The book looks absolutely beautiful!! Have a Great Birthday! Can’t wait to read the book. Happy Birthday! I borrowed Girl’s World from the library recently, what a gorgeous book! Happy Birthday!!! What a nice give-away!!! Happy birthday! What a beautiful book – those hanging pom poms on the cover are gorgeous! The colors in her book make me happy, I can’t imagine how I’ll feel once I actually get through one of the projects. Would love, love, love to win this book. Happy birthday! I love how you give other people presents on your big day 🙂 Hope YOUR day is great too! Happy Birthday…may you be blessed with many more. What a beautiful book! Thanks for the chance to win – and Happy Birthday! Happy birthday! Thanks for the fun giveaway! This book looks terrific! love whimsey-would love to have a copy. Is the give away open to international readers? I am in Canada. I LOVE reading your blog! Love the color and idea inspirations! Just wanted to wish you a happy birthday! Thanks for all the lovely things you do here on your blog! I love your blog! I also followed you on Pinterest. What pretty pictures! I love all of the white in the backgrounds…makes me think i need more of that in my home. Happy Birthday!! I would love this!! the book looks super cute! thanks! I love everything Jennifer Paganelli does! I would love to win this book. Beautiful, inspirational, colors, patterns and ideas!! I want this book! Super fun bright happiness and joy! Oh, I would love to win a copy of this book. Such a wonderful giveaway!! Love this book! The fabric colors are amazing. Would love to win this book! Already following TT&J on Pinterest! Happy Birthday. What wonderful friends you and Jennifer are. I love her book and fabrics and I adore your blog name! Happiest Birthday! Thanks for the awesome giveaway! Hope you’re having a wonderful birthday and thank you so much for your beautiful fabrics, patterns and books…and a great give away! Happy birthday!! !Thanks for the giveaway!!! Happy Birthday!!! love this giveaway! thanks! I need Happy Home! I have Girl’s World. It is a joy to just look at – such vibrant, happy fabrics and beautiful patterns. Thank you for hosting this giveaway. Beautiful fabrics and I love the patterns. She has an amazing talent. Thanks for sharing! Wow those are beautiful vibrant fabrics! I would love to have this wonderful book full of ideas! 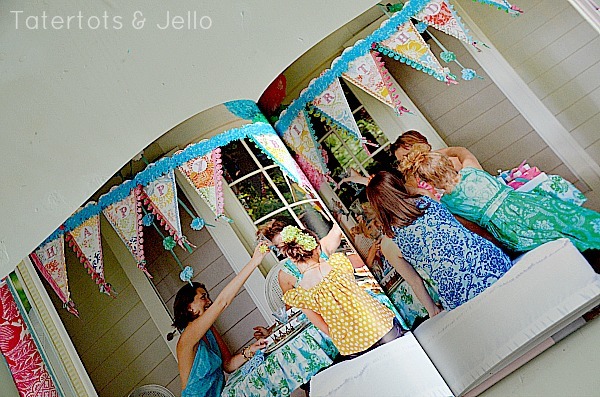 I love her fabrics… I could buy them all and just stare at them all day long! Oh man I can’t wait to get sewing.